December 3rd marks the release of Michael Schenker's Temple of Rock: Live in Europe on CD, DVD, Blu-ray and Limited Deluxe Edition. This essential live rock'n'roll release includes songs performed live in Tilburg, The Netherlands in May 2012, plus songs performed at London's 2011 High Voltage Festival. At the ripe age of 15, after a very early start in his professional music career recording his first album with the Scorpions and after joining UFO age 17, Michael Schenker focused exclusively on lead guitar and pure self-expression. The second chapter in his career was focused on experimenting and developing his expertise on a more musical and personal level. With excellent musicians, friends and fans from all over the world, this live recording is part of this celebration. 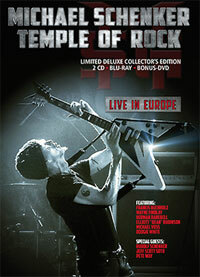 The concert from Tilburg, the Netherlands, which was recorded in May 2012, noticeably distinguishes itself from previous releases due to the line-up that includes Michael Schenker (lead guitar), Doogie White (vocals), Herman Rarebell (drums), Francis Buchholz (bass) and Wayne Findley (rhythm guitar, keyboards). In addition to this Tilburg concert, fans can experience extracts from London's 2011 High Voltage Festival with Michael Voss (vocals), featuring awe-inspiring guest appearances from Schenker's friends and musical companions including his brother Rudolf Schenker (The SCORPIONS) who plays rhythm guitar on “Rock You Like a Hurricane”, “Hanging On” and “Doctor Doctor”, UFO's Pete Way who plays bass guitar on “Doctor Doctor”, and vocalists Jeff Scott Soto (ex-JOURNEY), and Doogie White, who jointly sing on “Doctor Doctor”. Limited Deluxe Edition - 4 Discs Includes 2 CDs, 1 Blu-ray, 1 Bonus DVD. Bonus DVD includes the following content: Brighton Rehearsal / Doogie's Video Impressions.